A Victorian mansion with roots going back to the 11th century, Taplow was once owned by the monks of Merton Priory. It is now a Buddhist study centre but is open for special heritage days throughout the year. The area around Taplow has been settled since at least the Iron Age when a huge hillfort was erected here. In the garden is a 7th century Saxon burial mound. When the mound was excavated in 1883 it revealed a huge range of burial goods, second only in importance to the famous ship burial at Sutton Hoo in Suffolk. There was a Saxon manor at Taplow before the Norman Conquest. During the medieval period the manor was owned by Merton Priory, but after the Dissolution of the Monasteries, it passed into private hands. The manor house was attacked in the Civil War when it was owned by the Hampson family. In the following century, the estate was purchased by the Earls and Countesses of Orkney, who also owned nearby Cliveden. The house later passed to the Grefells, who called in architect William Burn to remodel the house in French Gothic style. The exterior is early Tudor in style, while the interior is stylish Romanesque. William Grenfell, 1st Baron Desborough, and his wife Ettie hosted regular social events for their inner circle of friends, called 'The Souls', including HG Wells, Oscar Wilde, and Edward, Prince of Wales. Their son was the war poet Julian Grefell, who died in action in 1915. After WWII the estate passed through the hands of several corporations until it was purchased by the lay Buddhist organization, SGI-UK. 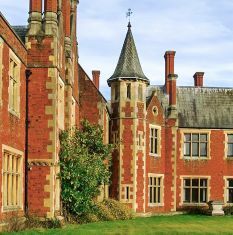 SGI-UK operate a Buddhist study centre at Taplow, but there are regular public days when visitors are welcome to explore the house and learn about its history.